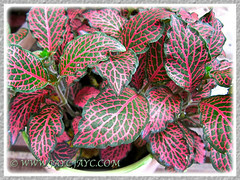 No wonder this showy Fittonia species is aptly nicknamed Mosaic Plant! Its intricately-designed leaves with contrasting coloured veins will provide a marvelous mosaic display that will attract and captivate all season through! These beautiful ornamental foliage plants make great houseplants, especially if displayed on bathroom shelves or bookshelves in shallow containers with their branches cascading down! Also wonderful when grown outdoors as plant fillers for garden beds or as groundcovers in tropical and warmer regions! Calling it Mosaic Plant or Nerve Plant with features that resemble its showy appearance is so much easier than by its tongue-twisting botanical names! 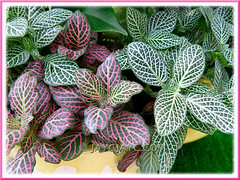 Researching to write this post really got us so confused…is it Fittonia albivenis, verschafeltii, argyroneura or what? Humph…so many conflicting info online as usual! Anyway, we’d rather fall back on the dependable, reliable and well-researched GRIN Taxonomy provided by USDA ARS, National Genetic Resources Program here. 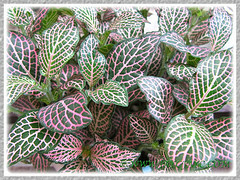 Features: Fittonia albivenis belongs to the genus Fittonia which consists of fifteen known species. It’s a compact, low-growing creeping perennial from the moist tropical rainforests of South America, reaching typically between 15-30cm in height and branching out to about 30cm wide. It has a tendency to vine when larger. 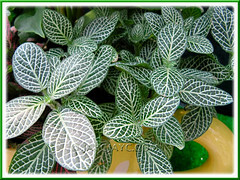 An evergreen herbaceous plant that is popularly cultivated for its lush and attractive mosaic or net-patterned foliage. Now, numerous cultivars have emerged with fabulous variegation and some varieties have crenate or wavy leaf margins too. 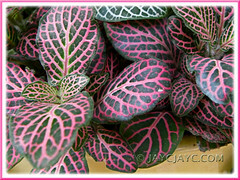 The beautiful variegated leaves, entire and opposite, attached to fuzzy stems are typically olive, dark green or lighter and distinctly veined in white to deep pink, in marvelous contrast. The size of its textured blades varies between 3-10cm long, depending on the varieties. The miniature compact forms have oval-shaped leaves with pointed tips while the larger leaves of the standard forms are broadly ovate and obtuse. These beauties are classified into two groups: the variety ‘Argyroneura’ with medium green leaves and white or silver veins, while ‘Verschaffeltii’ has dark green leaves with pink to rose-red veins. Fittonia albivenis produces a greenish spiky-shaped inflorescence with tiny insignificant flowers, white to yellowish in colour, appearing occasionally in good growing conditions. Culture (Care): Fittonia albivenis or Mosaic Plant, though known to require a little more extra care to grow, is well worth the trying! Just remember, it’s most happy with constant warmth, high humidity and bright light! Light: Best in bright indirect light or filtered sunlight but avoid direct sun that may ruin the foliage. Moisture: Water regularly, keeping the soil moist but not waterlogged. It’s sensitive to overwatering or underwatering. Yellowing of leaves resulting in browning and eventual dropping may indicate overwatering. A ‘fainting’ plant indicates it needs to be quenched whereby a quick watering will do the trick to revive it! It enjoys high humidity, so mist it as often as possible or alternatively, stand the pot on a tray of pebbles filled with water to just below the pot’s base. Withering of leaves may signify the need to increase humidity. Soil: Prefers an organic-enriched potting soil that retains water yet drains well. Others: Remove withered leaves and emerging flower spikes that are insignificant, if any. Occasionally pinch off ends of growing stems to maintain height and shape, as well as to promote more branching and denser foliage. Feed every two weeks with a general liquid houseplant fertilizer during active growth but sparingly during cooler clime. 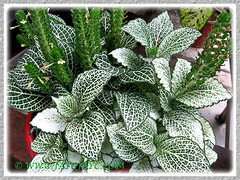 Mosaic/Nerve Plants rarely require repotting as they have shallow roots and grows well in small pots. When potbound, repot them in spring or when plants become straggly over the years, repropagate to rejuvenate them. Relatively free from serious pests and diseases, though watch out for mealy bugs, spider mites, snails and slugs. For subtropical and temperate regions: Hardiness: USDA Zone 11-12. These plants are happy with warm to moderate and draft-free conditions, so try to provide even room temperatures between 18-24°C. Good light, high humidity and sufficient watering are its main needs too. But be cautious with watering which should be reduced slightly from spring to late winter and feeding done sparingly in winter. It is frost-sensitive, so best to plant in containers that can be easily overwintered indoors for non-hardy regions. Propagation: Propagated by tip or stem cuttings that root easily in moist potting soil and located in a warm, humid spot. Alternatively, propagate by division. 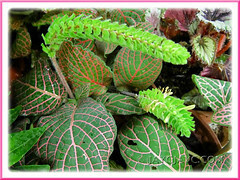 Usage: Fittonia albivenis is a great choice for terrariums and bottle gardens due to its need for high humidity, and being small, neat and compact in size, it’s just perfect. 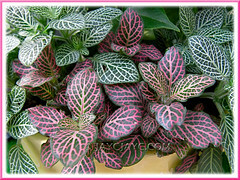 It’ll be an excellent colourful houseplant too, to brighten homes or offices, indoors. And, suitable for growing in a greenhouse or conservatory and even lovely to let it cascade over a hanging basket or window boxes. Great as a container plant or outdoors, as a groundcover in garden beds or borders. It’s used as a traditional medicine by the natives of the Ecuadorian Amazon, the natives use the decoction of the bruised and boiled plant to relieve headache or muscle pains, and a leaf tea to ease urinary pain or difficulty. The newer range of neat and compact-growing cultivars with their explosive foliar colour variegation on undulated and crenate leaves, never seen before, will surely surprise and delight many as it did me, when I chanced upon their loveliness at My Green Space, NParks. I often feel intimidated when looking at this very wonderful plant – and often too, never found anyone keeping or managed to propagate – let alone, having this plant thrive in their gardens. Do you think one can keep this sucessful in a garden with a moderate care? Could this plant thrive in my garden? What’s your opinion? I’ve always thought that they grow very very slowly or difficult to care for. Now I’ll think again the next time I see this at the garden centres. Maybe I’ll plant some in my miniature flower pots. James – Why not! 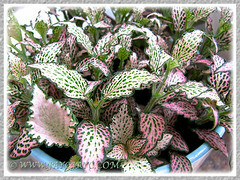 Seeing your lovely garden plants, some of which are very challenging ones, I’m pretty sure that these Mosaic Plants will grow well under your expert care. We’ve planted the green kind before on ground many years ago hoping to cover spaces below some seedlings of Bird of Paradise at our inner garden plot at the frontyard. They did grow well initially but all eventually perished during rainy seasons because the soil was too clayey and got water-logged easily! Pondering further, I think that water falling from the plants above (we occasionally shower the leaves of Bird of Paradise as they appear curled and dry most times) must have drenched the Mosaic Plants that grew below and hasten their demise! If at all we decide to plant them again (when we do find one of the newer attractive cultivars? ), into the pot they’ll definitely reside this time! Autumn Belle – I think it’s a good idea to take up the challenge and plant them in pots! That way you can easily control its favoured conditions, especially the lighting, watering and misting! You’re most welcome, Eunice. Glad to know the tip helped.